Braking: Instead of regen braking, the Slipstream uses a freewheel mechanism to maximize power usage. The freewheeling hub allows for full coasting ability downhill and in anticipation of stopping, allowing for maximum use of energy. This is a more efficient use of energy than implementing regenerative braking systems, i.e. less loss. Battery Charging: Ability to be charged via solar array, 120 volts AC, any DC voltage less than 60 volts, including charging from a car through cigarette lighter. Lighting: Two, 20 watt halogen headlights and 15 red LEDS wired in a cluster for rear light (not pictured). How much does it cost to build a Slipstream? If you exactly follow the plans, around $650. Some people have built scaled down versions of the Slipstream for around $450. Prices for many parts have come down quite a bit in the last 6 months. I have some extra car batteries. Can I use them to power the Slipstream? I don't suggest it. The batteries used on the Slipstream are maintenance free, deep cycle lead acid batteries. The deep cycle is very important. It means that the batteries will not get hurt by draining them all the way or almost all the way. This is not true for car batteries. Discharge a car battery down to about 20% and you steal life from it. What can I really expect from these "deep cycle" batteries? While there are some exciting new breakthroughs in battery technology, such as Nicad and NiMH, your best cost/benefit play is to buy deep cycle, gel cell lead acid batteries. These should be the only components on your Slipstream that require maintenance, i.e. charging properly (see below). Given that, the Slipstream's maximum parameters are 25 miles and 30 mph. Lead acid batteries exhibit the "1/3 Rule." Basically, if you choose maximum speed, i.e. 30 mph, expect to get 1/3 on the distance parameter, i.e. 8 miles. If you decide to go the full 25 miles on a charge, expect to be able to use 1/3 of the maximum speed, or 10 mph. As you can see, striking a happy medium is the best way to go. I find that cruising speeds of 15 to 18 mph provide for the best balance between speed and distance. Do I need a license to operate the Slipstream? I wish I had a clear answer to this. I have had many discussions with the New York State Dept. of Motor Vehicles. They claim no license, inspection or insurance is required since this is a bicycle. I highly suggest that Slipstream users have some type of insurance - just in case. I have been using the Slipstream for two years and have never been ticketed or had a Police Officer give me a hard time. Usually, they stop me just to learn more about the Slipstream. How does the Slipstream control the motor's speed? The motor's speed is fully controllable from 0 to about 30 mph using a solid state motor controller. Using a throttle on the Slipstream's right handlebar grip, you have full control of the Slipstream's speed and acceleration. A motor controller is far better and more efficient than relays or contactors. What kind of bicycle is a good candidate for converting to a Slipstream? A mountain bicycle frame made of steel is perfect. The idea here is strength and safety. Can I pedal the Slipstream? Not the way I have designed it. This is a fully electric vehicle. I will be adding to the plans a section which includes mounting the motor above the rear tire so the pedals stay on the Slipstream. Click here to see our pedal/electric bicycle, called the PedElec. I have read a lot about friction drive versus direct drive. What is better and which system does the Slipstream use? The Slipstream uses direct drive, i.e. a chain from the motor to the bicycle's rear wheel. 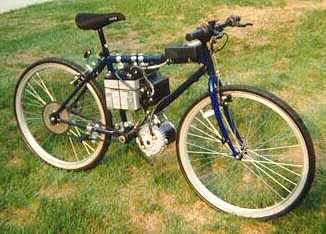 This is a very efficient and reliable way to drive an electric bicycle. Friction drive pertains to a drive system where the motor's axle is pressed against the rubber of the bicycle's rear, or front, wheel. Friction drive has several disadvantages: faster wear on the tire, slippage under acceleration and slippage when operating in wet or sandy conditions. Does the Slipstream use Regenerative Braking? No. Regen Braking is expensive to implement and falls prey to one of the Laws of Thermodynamics: no energy transfer is 100% efficient. Essentially, with regen braking, the motor is used as a brake and creates electricity which is used to charge the batteries while you are riding and braking. There is energy loss from the bike's momentum to the motor, from the motor to the charge controller, from the charge controller to the batteries and then you have more losses when taking this energy out of the batteries to power the Slipstream. The Slipstream uses a freewheel system. You can coast on the Slipstream and this is a far better and more efficient use of the bicycle's kinetic energy - the fact that it has energy "stored" in its forward motion that you can capitalize on by coasting. I have never been on an electric bicycle. Is the Slipstream really that fast and strong? The Slipstream has more power than most people realize. It can easily beat even the fastest car from a stop for the first 150 feet. How do you charge the Slipstream? You may charge the batteries in series, requiring a 24 volt charger, or in parallel, requiring a 12 volt charger. What is critical, is to make sure the charging voltage does not exceed 14.0 volts. If you exceed this voltage, you may very well ruin the electrolyte and destroy the batteries. In addition a "smart" charger is an excellent idea. A smart charger senses how full a battery is and reduces the charging current so as not to overcharge the batteries. I have been charging my Slipstream using the sun with solar panels. Email me for more details. I don't suggest them. There is no free lunch. A fast charge is messy and not as efficient as a slow charge. Generally, a battery should be charged at a rate so that over 14 hours you have given the battery 110% of its capacity. For example, a 13 ampere-battery times 110% = 14 ampere-hours, so to get 14 ampere-hours over a 14 hour period, the charge rate should be 1 ampere per hour. Do you sell the completed Slipstream? No. There are plenty of manufacturers of electric bicycles out there. I show hobbyists how to build their own. You'll save money and have the lasting satisfaction that never comes from running out and buying a finished product. Plus, I believe the Slipstream has more power and speed than anything else on the market. How can I get more range on the Slipstream? You can easily change the range/speed parameters of the Slipstream by simply changing one gear on the gear drive. Want more range, use a 24 tooth sprocket instead of a 20 tooth. While I don't recommend gearing the Slipstream to go faster, i.e. more than 32 mph, you may be willing to sacrifice some top end speed for more range, i.e. torque.